I still really liked this book, but I don't think it was as strong as the others. I absolutely loved the traveling and the the conflict that arose, but I am not sure that this was a suitable ending for the series. It's a situation where I feel like there could have been a forth book that tied things together better, even if it was just for the sake of the overall plot development of the series. It is slightly different for this series though because, not that the books aren't connected, but there isn't a major conflict that needs to be resolved throughout all three books. You definitely still need to read them in order, but it seems like each book has it's own separate issue. Dana: Despite her moments of extreme stupidity, I loved Dana. Some of my favorite moments from the series were when she challenged the fae and their archaic views or just was outright sassy as hell to them. It was spot-on fantastic. I still think that she shouldn't necessarily be with Ethan. He still isn't my favorite, but oddly enough, I don't have any ships for her either. I think this is the one time where not only do I think she could be on her own ('cause tbh, lots of YA heroines don't need somebody), but that she doesn't have any legitamite options at the moment. Sorry shippers, I can't agree with any of them for this series. :/ Oh well. Erlking: This book was like a wake-up call when it came to the Erlking. I still stick by my standing that he isn't a horrible person. But I'm pretty sure he sees Dana as nothing more than interesting. So that's not a ship. I can't hate him though, he just doesn't seem that bad still. Ethan: By the end of the series, I didn't mistrust Ethan as much as I originally did. I still don't completely trust him, and I still don't think he and Dana should be together, but I also don't think he means ill anymore and he's starting to try. It could also just be something that got lost in translation in the development of his character and his relationship with Dana. I still don't ship them though. Keane: We lost Keane moments! Of all the characters in this book, I feel like we lost a lot of potential development for Keane's characters. Which sucked too because he is a really cool character, and he obviously developed somehow, because he ends up with Kimber. But we didn't really get to see that development, and I wish we had, because it would have rounded out the story so much more. Side note of appreciation for Dana's dad. Of all YA parents, he's probably one of the best that I've read of, and I find that particularly strange because he's fae. Good for him though, because he was supportive, but not pushy, and he never tried to make Dana feel belittled or unheard. We got to go to Faerie in this book!! I really liked this part of the series too. It was like a combination of Alice in Wonderland and Outlander. I thought it was amazing and the descriptions of some of the creatures were incredible. We didn't just get a description of the physical world, but also of the creatures that lived there. We also had a description of the castle, and I looked up the picture of what it was supposedly based off of, and it's pretty cool. I think I will love the world that Jenna Black has created for quite some time to come. I'll say it again in this post: I would love to visit Avalon!! In general, but especially if there were actual fae :). WRITING: One of the things that I really appreciated about this series is that Jenna Black's writing stayed consistent. All three books had the same awesome sense of humor running through them and they all kept the same light, fun, easy-going reading style. 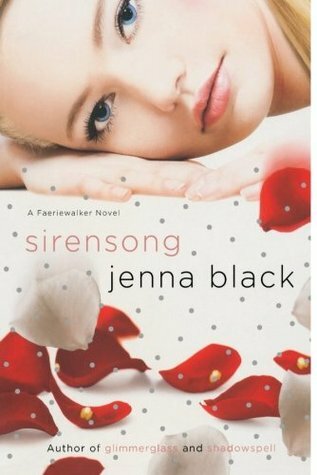 The one thing that confuses the HELL out of me though is why the third book is called SIRENsong. Yes she sings, but I don't think the word "siren" was ever used in any of the books. I might have just missed it I guess...? I binge-read all three of the books in this series, Glimmerglass, Shadowspell, and Sirensong, within a week. I think this might be the best way to do it for these books. Read them one after the other. They were so much fun to read! I don't think I can emphasize that enough- they. were. FUN. Sit back, relax, and get lost in the books.